Every year, drunk drivers put nearly 112 million people at risk because of poor decisions and dangerous habits. Choosing to drive while intoxicated can lead to extremely severe accidents that ruin lives and futures. According to the most recent data, nearly 25 people are injured every day in Pennsylvania from drunk drivers. Our law firm witnesses the results of these terrible accidents daily. When you've been injured by the negligence of a drunk driver, it can turn your world upside down. That's why our team of legal professionals is here for you. We can fight to get your expenses paid and get you the compensation you deserve. 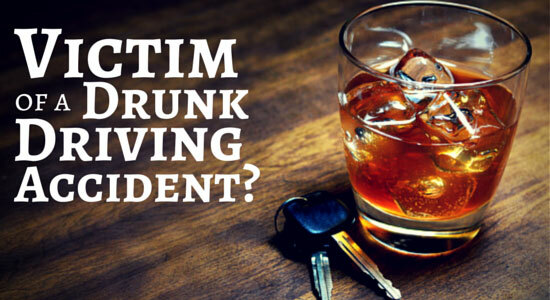 Car accidents, especially those caused by drunk drivers, can be devastating. Intoxicated drivers will often take dangerous risks, speed, or fall asleep at the wheel, resulting in serious car accidents. In fact, alcohol-related deaths make up nearly 1/3 of all traffic fatalities in the United States. We'll make sure your injury isn't just another tragic statistic. We'll fight to get you compensation for your injuries, your lost time at work, and your pain and suffering. Insurance companies can be downright uncompromising when it comes to paying their fair share after an accident. That's why having an experienced legal team on your side is your most important advantage. We'll handle the hassles while you focusing on healing. We'll be with you every step of the way to let you know what to say and what to sign, the steps to take after your accident, the importance of having Full Tort on your car insurance, and much more. The following links provide a wealth of information about Pennsylvania drunk driving laws and statistics. Know your rights if you're injured by a intoxicated motorist. If a drunk driver injured you or a loved one, contact our law firm for a free legal consultation. We'll get you the answers – and legal help – you need. It's free to speak with us, and you're never required to hire our law firm when you call. For over 35 years, we've been fighting and winning compensation for our injured clients. We'll work to recover money for your medical bills, lost wages, and pain and suffering. And remember, there's never a fee unless – or until – we get money for you.